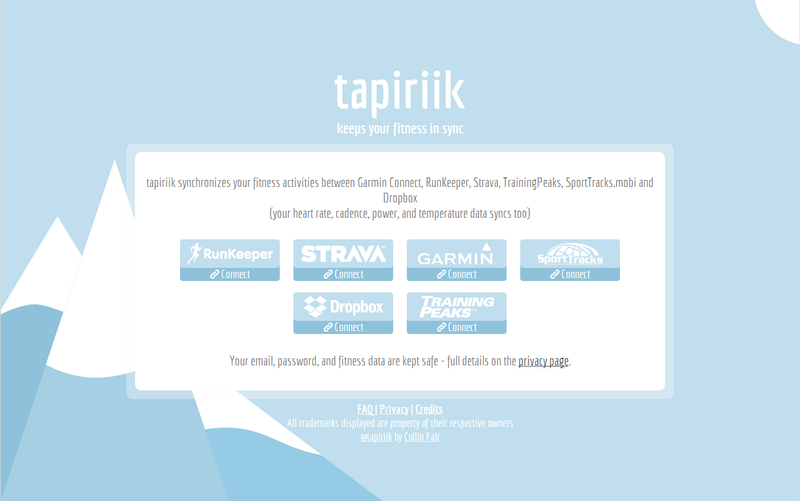 How to publish your Garmin training data to other services with "tapiriik"
There is a new way to publish your training data on multiple services with just one click. And you know what? It’s completely free! 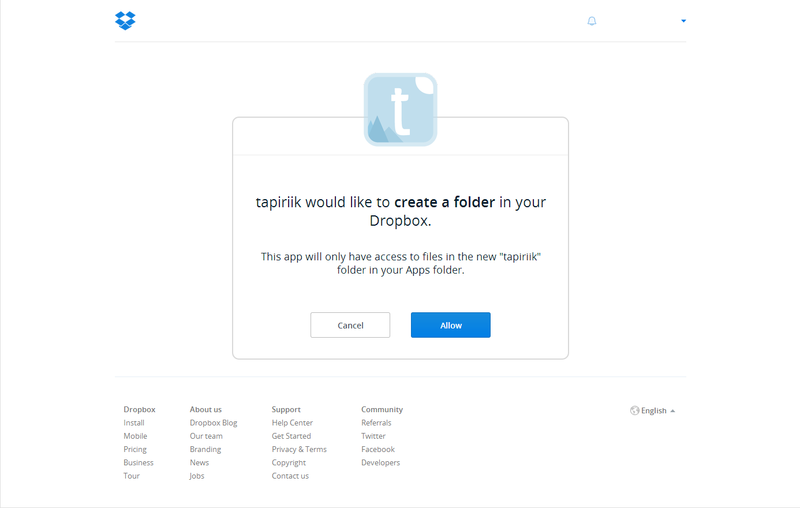 The name of this great tool is “tapiriik”. 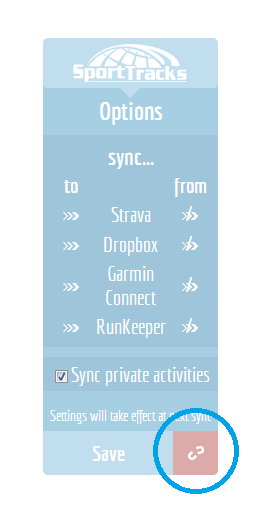 At the moment it supports synchronisation of SportTracks, Garmin Connect, Strava, RunKeeper, Dropbox and TrainingPeaks. With just a few settings you will be able to backup your training data on different databases. The home page as it appears at your first access. The login to each service can be done just once at the beginning, with the normal User+Password method. Saving the credentials will limit this operation at just the first access. After that you will just need to access tapiriik and do the sync. To connect a service, just enter your login data. The options you can manage are explained in the picture hereunder. You can simply decide, for each service, from and to which other service synchronise your data. 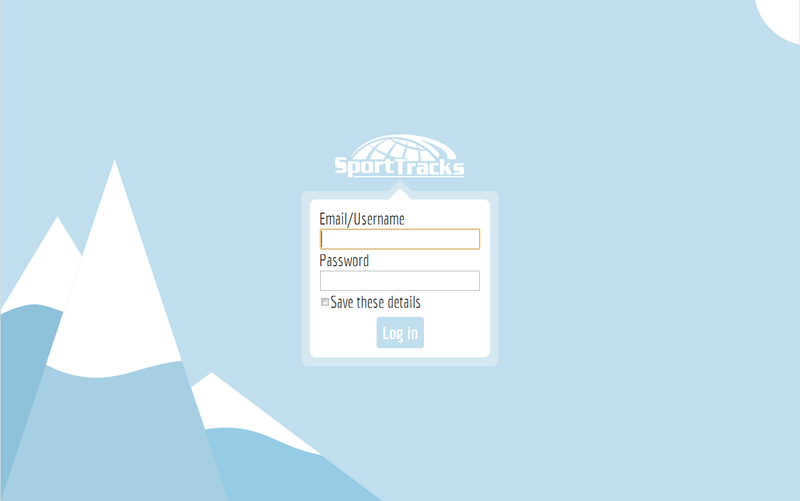 In this example I decided to sync the other services starting from SportTracks, because that’s where I have my main log. The “Options” window of each service will allow you to decide what synchronises what. 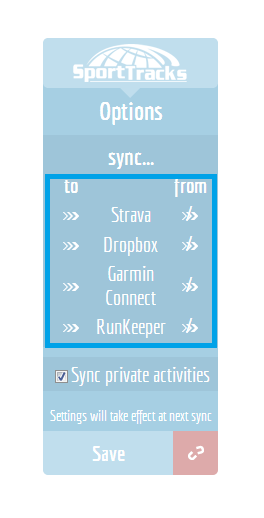 Just click on the arrows under the “From” or “To” option to activate or deactivate the direction of sync. If you suddenly decide that you don’t want to use one of the services any more, you can just unlink it under the options menu. Nothing will be deleted, in case you do it accidentally. To disconnect a service just click on the “unlink” button in the options window. Nothing will be deleted after disconnecting a service. Some websites like Dropbox will require an “app authorisation”, like showed in the following figure. Also RunKeeper works with apps, so you will be asked for the same thing. 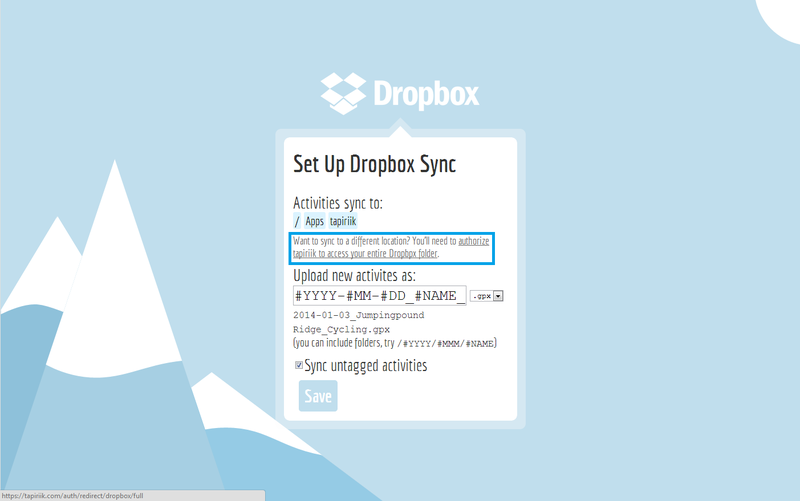 For some services, like Dropbox, the login comes as an external app authorisation. Since Dropbox works directly with folders, you are allowed to choose where to save your files. Also the file extension (*.tcx or *.gpx) can be selected, like the naming system. Simply click on “Reconfigure” under the service icon to activate the options window. In Dropbox options you can also decide the target folder, the file format and the file naming system. After the general setup just click on “Synchronize now” to start the sync. If your database is large, the operation will require some minutes the first time. After that, if you will do it with a regular cadence (let’s say once every one or two weeks), the sync time will be less than one minute. Clicking on “Synchronize now” will start the synchronisation between the selected services. Closing the window after this operation won’t affect the sync. There is also the possibility, by paying just 2.00 $ a year (! ), to have the synchronisation automatically done for you. Definitely a reasonable price, don’t you think? + A service like this coming for free is absolutely good news. + Having the chance of using Dropbox is a remarkable step towards data ownership freedom, since the users can migrate their own data as they prefer (that’s also the philosophy of SportTracks‘ team). + Heart rate data, where available, are correctly transferred among services. + The website is very simple and usable. + The sync time has been improved a lot in the last months. + The following cons are not directly linked with tapiriik, but are the result of a great lack of standardisation between platform services. – Strava doesn’t import no-GPS files; this is a problem for people doing indoor training sessions. – RunKeeper imports no-GPS files, but sometimes doesn’t take into account the corrections made and you can often find activities with correct duration, but empty distance. – Garmin Connect shows the same problems as RunKeeper does. – In general, I’d like to see the corrections made on distance, since GPS devices often over-estimate distances.